Fall is in the air, and if you’re like us, then you probably can’t believe how quickly the summer went by. It seems like just yesterday that we were out at summer barbeques and performing siding installations around the Blue Springs area, but now we’re preparing for Halloween, Thanksgiving and the business of the holiday season. 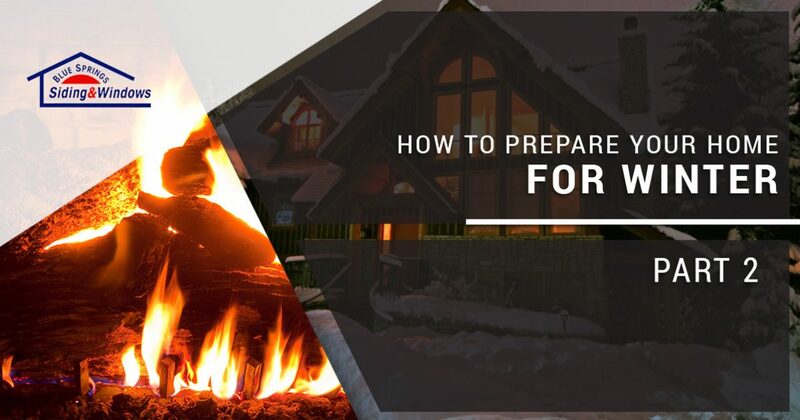 We provided you with three ways to prepare your home for winter in a previous post, and in today’s post, we’ll explain three more ways to get your home ready for winter. When you’ve finished reading this post, get in touch with a member of Blue Springs Siding and Windows or come by our showroom to learn more about how we can help you improve your home’s beauty and functionality. In our previous post, we mentioned that you should be on the lookout for ice dams as the winter progresses. This is certainly something you should do during the winter, but before the winter begins, you should take the time to closely examine your roof for holes, weak spots, and damaged shingles. You don’t want to have your roof leak and ruin your flooring or furniture, so inspect your roof yourself or call a professional to do the inspection for you. If you need to invest in a roof replacement, then get in touch with the roofers at Blue Springs Siding and Windows to request an estimate for your home. We will gladly provide you with the information you need to make an informed decision for your home. Think of your siding like an extended blanket that wraps around your home. If there are holes or weak spots, then the heat that your HVAC system produces won’t stay put, and you will likely find that your energy bills are higher than usual. Your siding may have become damaged during a summer storm, or simply due to normal wear and tear, so do a thorough inspection to see if you need to invest in a siding installation before winter is in full swing. We perform both vinyl siding installations and James Hardie siding installations, so just come by the Blue Springs Siding and Windows showroom to learn more about how we can help you improve your home’s efficiency. If you live in an area with luscious, fully grown trees, then you’ve probably been enjoying the shade and beauty they provide during the summer. As the summer comes to a close and the leaves begin to fall, you should check to ensure that none of your branches are endangering your home. Be sure to trim any branches that extend across your roof, as heavy wind or snow could cause the branch to break off and damage your roof. 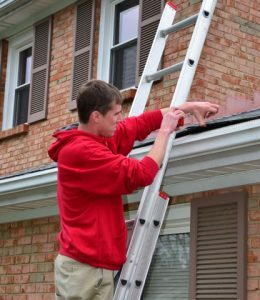 Further, we noted in our previous post that a gutter guard installation can help you keep leaves, pine needles, and other forms of debris from clogging up your gutters. Pruning your trees can help you keep leaves from falling into your gutters in the first place, providing your home with even more protection. We hope that this miniseries will help you prepare your home for the winter weather that’s just around the corner. Blue Springs Siding and Windows is your trusted resource for window installations, siding installations, door replacements, and other home improvement projects. With an unparalleled dedication to customer service and a lifetime guarantee on every product and service we provide, you can rest assured that you’ve chosen the right window and siding company for the job. Use the button below to learn more about our services. We look forward to speaking with you!